Franklin Delano Roosevelt is the longest-serving President in history, a record 13 years in office. Sunrise at Campobello, the story of his polio and return to public life, feels just as long. It should not be a surprise that Sunrise at Campobello is so laudatory towards FDR as to go beyond reverential to almost worshipful. The fact that FDR's widow, former First Lady Eleanor Roosevelt, was still very much alive and is thanked for her assistance, all but guarantees that Sunrise at Campobello is not going to be a deep exploration into the foibles of our 32nd President. 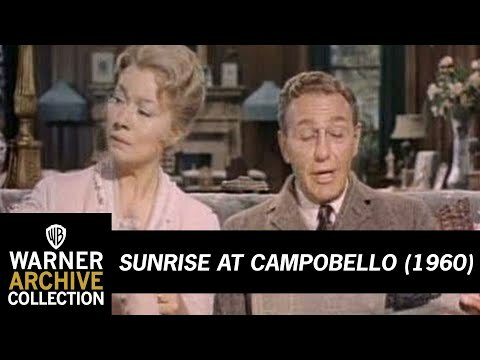 If not for some good performances, Sunrise at Campobello would almost be dismissed as something brought to you by the Democratic National Committee. 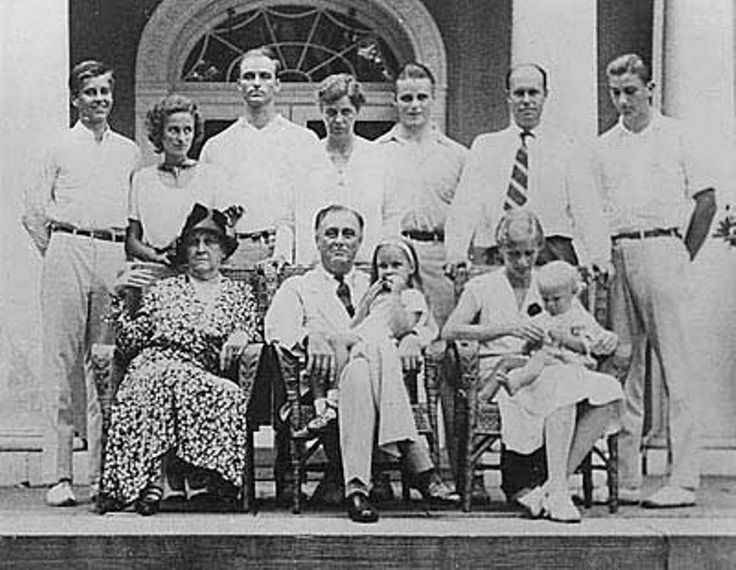 In 1921, patrician Franklin Delano Roosevelt (Ralph Bellamy) is enjoying his summer retreat, Campobello (Beautiful Field in Italian), with his wife, Eleanor (Greer Garson) and their five children. It's here that Franklin's usual swim does not give him his usual energy, though insisting on staying in his wet clothes does not help. Things go from bad to worse when Franklin collapses, then finds he cannot walk or move. Coming to Campobello is FDR's political guru Louis Howe (Hume Cronyn) and later on, the strong-willed Mrs. Sara Roosevelt, FDR's Mommie Dearest (Ann Shoemaker). The diagnosis is grim: infantile paralysis, better known as polio. Everyone, from Eleanor to Sara to FDR's loyal girl Friday Missy LeHand (Jean Hagen) think his political aspirations are finished. Sara is especially gratified by this idea, as she has never thought politics was a worthy profession, especially for her little boy. It's only Howe who won't give up the idea of a political future for our figure. 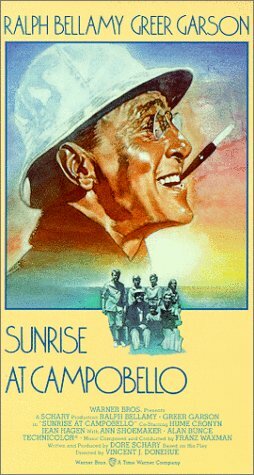 In the years from his diagnosis to his return to public life when he nominates New York Governor Al Smith (Alan Bunce) for President in 1928, Sunrise at Campobello chronicles the struggles for Franklin, the increasing role for Eleanor, and his ultimate comeback. Dore Schary, adapting his Tony Award-winning play, apparently loved his own work so much he opted to not cut. Either that, or Sunrise at Campobello the play must be an awfully long evening of theater, as the nearly two and a half-hour running time for the film felt far longer. Without getting too much into things, this crucial part of the evolution of FDR was covered much better in the miniseries Eleanor & Franklin, where we saw the wily politician at his most vulnerable: physically, emotionally, and spiritually. In that version of the Roosevelt's story, FDR was flawed, sometimes angry, sometimes even bitter, working his way past his ego and frustrations while masking things behind that grin. With Sunrise at Campobello, too much time was taken up showing FDR as this almost God-like figure that one wonders how someone so great could have had anyone opposing him. I could not shake off the idea that this is how Stalin would have been portrayed in Soviet films prior to his death and denunciation. It was extremely laudatory, deeply reverential to where it plays almost as farce. Much of this comes from Schary's script, which gives FDR no faults. We don't see him as angry, or hurt, or afraid. The closest comes when he admits to Eleanor, "It's a hard way to learn humility, but I've been learning, by crawling". Even when he snaps at his daughter Anna (Zina Bethune) about her dropping some books, it is soon quickly forgiven on both sides. The other characters are also given a bit of a bum rush. Eleanor's evolution into being the activist/busybody she grew into (depending on your point of view) was not explored. The children, while on the whole good, were there at times almost as decorative pieces, adding little except domestic bliss. The fortunate thing is that Sunrise at Campobello has quite good performances in it that save it from being a total snoozefest. 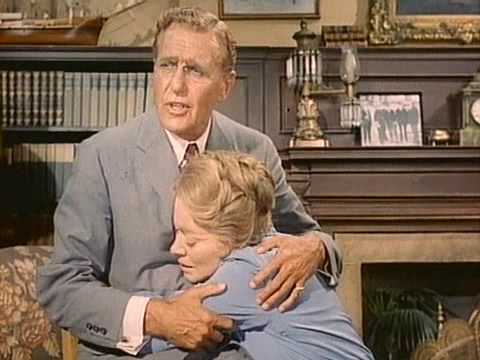 Ralph Bellamy was celebrated for playing President Franklin Roosevelt, and here he recreates his Tony Award-winning performance, a performance he would recreate decades later in The Winds of War and War and Remembrance miniserieses. I confess that at first I didn't 'hear' FDR's distinctive patrician voice (as a side note, I thought Edward Herrmann sounded more like FDR in Eleanor & Franklin, but I digress). By the end of it, however, I accepted Bellamy's portrayal of the future President as good not great. Much better was Garson as Eleanor, who did capture Miss Ellie's distinctive voice and speech patterns. To be fair, Garson had the real Eleanor present to study. Garson is probably too glamorous to play our dowdy, lanky Miss Ellie, but she did a first-rate job. She was allowed some growth, particularly when she breaks down in tears while reading a children's story to her youngest. It was the supporting characters who were the standouts. Cronyn was an excellent Louis Howe, the blunt, wheezing political operator who brooked no opposition and saw in FDR a savior for America. Shoemaker too was elegantly haughty as Sara Roosevelt, one who was used to getting her way. It's a pity that the material did not play more to the real struggle: between Mama Sara and Our Miss Ellie over Franklin's soul. It also could have done more to show the struggles of the dysfunctional Roosevelt family versus the cheerful facade. That would have given better roles to people like Bethune (who made Anna almost a screaming, spoiled brat) and a surprisingly good turn from Tim Considine as James, their oldest. Considine, best known for his work on The Mickey Mouse Club serials Spin and Marty and The Hardy Boys, showed he had great promise as the loyal son. Hagen had a lesser role as the loyal Missy LeHand, but she showed LeHand to be thoroughly professional. It would have been nice if Franz Waxman's score weren't so dominating as well. Sunrise at Campobello touches on what should be a turning point in the life of one of the great President. Sadly, it plays like his political career is more for therapy than for anything else. On the whole, Sunrise at Campobello is too busy being noble to be good.